While it would be difficult for someone not familiar with sewing to make anything by the use of this book alone, it is a valuable reference for the order of the steps and also for the comments which can be used to guide fashion. In company with the modern books on sewing, this book makes a lot more sense. 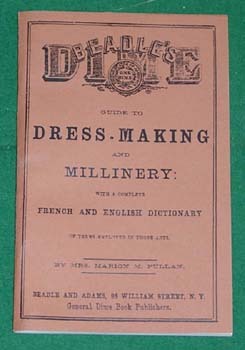 It is also valuable for its "Dictionary of Millinery and Dress-Making, its discussion of fabrics, and its list of definitions for period sewing terms.